Dental implants have quickly become the most preferred solution to treat all degrees of tooth loss as implants offer a life-long solution. With a success rate of over 95 percent, dental implants allow you to permanently restore your oral functions and health with an option that looks natural. Unlike other forms of tooth replacement, you will require a surgical procedure and not everyone is a candidate for dental implants. Dr. Anthony Giamberardino offers dental implants in Medford. If you are considering dental implants to treat your tooth loss, Dr. Giamberardino has the information you need to know about the process. 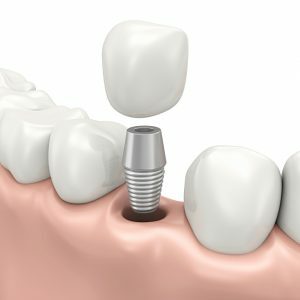 Where Do I Go First for Dental Implants? If you are interested in dental implants, your first step is to visit an implant dentist in Medford. While just about everyone is a candidate for dental implants, you will need to undergo a thorough consultation. During the initial consultation, your oral and overall health will be evaluated. You must have healthy gums and enough bone density to support the implant. You must also have minimal risk factors that may lead to implant failure. Those who have compromised immune systems, difficulty healing, or partake in certain lifestyle habits are not suitable for dental implants. If you are a candidate for dental implants, a treatment plan will be created to replace your missing teeth. During the first phase of the procedure, you will visit an oral surgeon. While under general anesthesia, the oral surgeon will insert bio-compatible posts into your jawbone. Once the implant post is in place, the healing process begins. Over the next several months, your jawbone will naturally fuse to the implant post, allowing the prosthetic crown to be securely held in place. After your jawbone has healed, abutments are placed onto the implant post. Abutments will hold the prosthetic dental crown to the implant post. Once this is complete, the restoration process begins. Dr. Giamberardino will attach custom-made prosthetic crowns to the abutments to restore your smile and oral function. After your dental implants are in place, the biggest threat to implant failure involves infection. Therefore, you will need to practice proper oral hygiene. You will need to take extra measures to keep the mouth as free from bacteria as possible, especially around the implant posts. In addition to home care, you will need to visit your implant dentist in Medford twice a year. This is necessary for regular checkups and cleanings. In addition, we will check the implants to ensure they are functioning correctly and no repairs to the prosthetic crowns are needed. If you are suffering from tooth loss, it is time to invest in your smile with implant dentistry in Medford. We will permanently replace your missing teeth with the most preferred option. You will regain your smile while also achieving proper oral functions with dental implants. If you are interested in dental implants, contact Dr. Giamberardino today to schedule a consultation. Comments Off on What to Expect when Getting Dental Implants?